Amsterdam is a great city for a layover tour. Although I’ve often considered it, this was the first time I scheduled a layover long enough to have a fun, no-stress day in the layover city. When considering a layover city visit, the most important question is do you have enough time to get into the city, enjoy yourself, and return to the airport with 2 hours to spare to go through security. 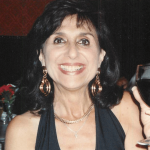 The answer depends primarily on transportation from the airport into city, and your tolerance for stress! How close are you willing to cut it when calculating a time to return to the airport? Here are my tips for planning an Amsterdam layover. What makes Amsterdam a perfect layover city is the easy-peasy train that runs from Schiphol airport into Amsterdam in just 20 minutes, with trains running every 10 minutes or so. In addition to the low price and easy access, the train is ideal because rush hour street traffic does NOT affect it. But there can always be unseen delays, so leave plenty of time. Here are my tips, along with a guesstimate as to how long each step takes. Stash your carry-ons in the baggage lockers. 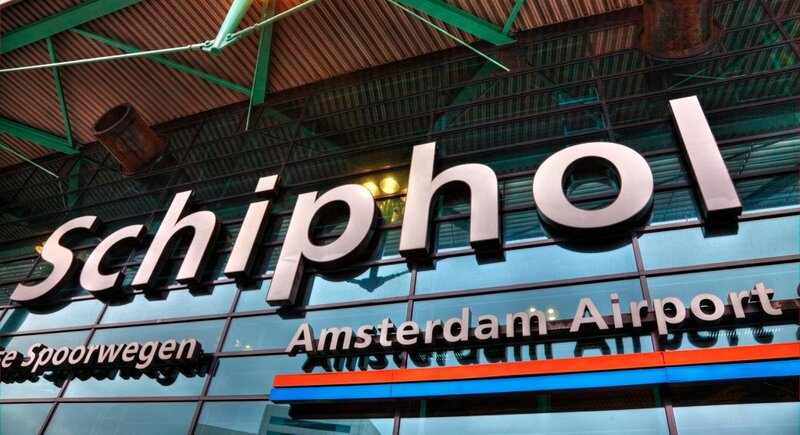 1) Upon arrival at Schiphol, look for the self-service baggage lockers to store your carry-ons. There are two sizes, but even the small was big enough to store stuff for three of us. The instructions are in English, they cost €7, and are paid with a debit or credit card. You will get a printed receipt with a PIN to open your locker upon your return. You will find these lockers at Departure Lounges 1, 2, 3, and Pier D; Arrival Hall 3; and the Baggage Basement Square at level -1. Allow 30 minutes. 2) Follow the signs to the train station which is BELOW the airport. There are machines for buying train tickets but I’ve never been able to get them to work with my American credit cards (which do not have embedded chips, unlike their European counterparts) and the machines are NOT in English. Because of this I’ve always gone to the Service Desk, which adds a small service fee. Round-trip tickets including the service fee are still under €7. There are ATMs right next to the Service Desk if you need euros. Buy round-trip tickets to Amsterdam Centraal (Amsterdam Central Station). This will save you a few minutes and a few cents on the return trip. The attendant will tell you which train platform you want (they all speak English.) There are two sets of stairs that go down to the trains, each labelled with the platforms served by that staircase. The trains run on an honor system. Keep your ticket with you. You’ll only need to show it if a transit officer asks to see it. Allow 30 minutes. 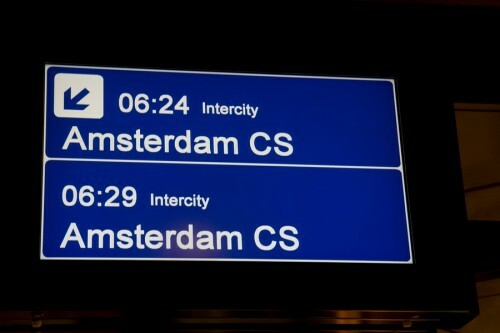 Look for a train that goes to Amsterdam Centraal (Amsterdam CS). 3) Take any train going to Amsterdam CS (Amsterdam Centraal). You will see the destinations listed on the information boards (look up) as the train pulls into the station. If you have any DOUBT, just ask one of the conductors standing by the train doors. Allow 15 minutes. 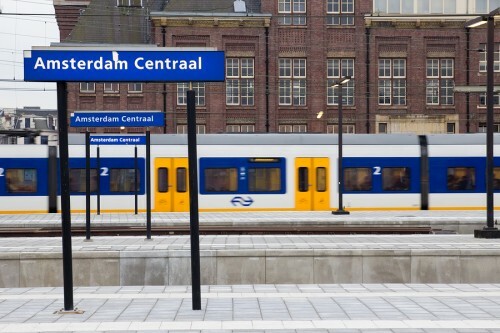 4) Depending on which train you take, Amsterdam Centraal will be either the first or the third stop. It will be announced over the loud speaker, and displayed on an information board inside each train car. Allow 25 minutes. 5) When you arrive at Amsterdam Centraal, there are information booths near the exits with free maps. Amsterdam is a great city for walking, but there are alternatives, such as tour buses and taxis. Whew, you’ve arrived, but as you can see it might take nearly 2 hours just to get to Amsterdam. For the return trip, you can probably safely allocate just one hour from the Centraal train station to the your locker. But you should also allow 90 minutes for security. Bottom line: you probably need 4 1/2 hours just to get out of the airport and back in. Our layover was 12 hours, so we had 7 1/2 hours to enjoy Amsterdam. So, what to do? I like walking, and Amsterdam is a great city for walking. Here are some more specific ideas. Amsterdam is a great walking city, but be careful of the bike riders. They ALWAYS have the right of way. 1) Download the TripAdivsor Amsterdam Offline City Guide app. This is an app that does NOT require WiFi to run. In addition to the usual recommendations for tourist attractions and restaurants, it has a handful of self-guided walking tours. I’ve done a few of them. I like the Jordaan tour, because it takes you out of the hub bub by the train station and (bonus points) it takes you right by the Anne Frank House. 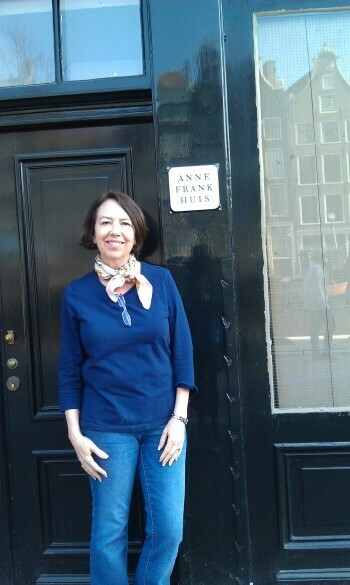 The Anne Frank House is a must-see museum. 2) You can’t mention Amsterdam with mentioning the Anne Frank House. I think it’s a very worthwhile tour, but you absolutely need reservations. Without them you might spend two or three hours waiting in line, which is completely ridiculous. Just go online, and book a time slot. 3) Schedule a one-hour guided tour of the highlights of the Rijkmuseum in English, Italian, French or German. This pre-purchased €20 entrance/tour ticket will also save you lots of time waiting outside, because you’ll be able to go in the VERY SHORT line for people with scheduled tours! 4) Book a walking tour of Jewish Amsterdam with Naomi Koopmans. 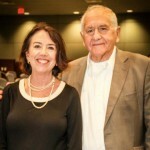 5) Take a World War II Walking Tour with Peter Schaapman. 6) Do a self-guided tour through the Red Light district. 7) Eat Indonesian rice table (rijst tafel) at Sampurna. It’s expensive, but I’ve always enjoyed it. Be sure to arrive hungry. Cafe Chris is a “brown cafe” or pub open since 1624. 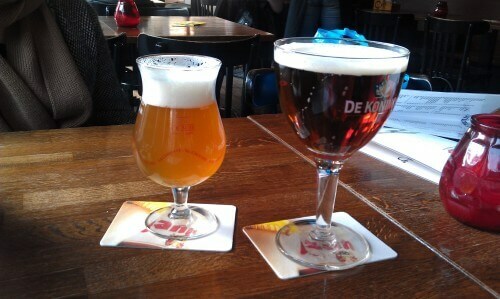 8) Enjoy the local beer at one of Amsterdam’s brown cafes (or pubs.) Many of these are quite old. 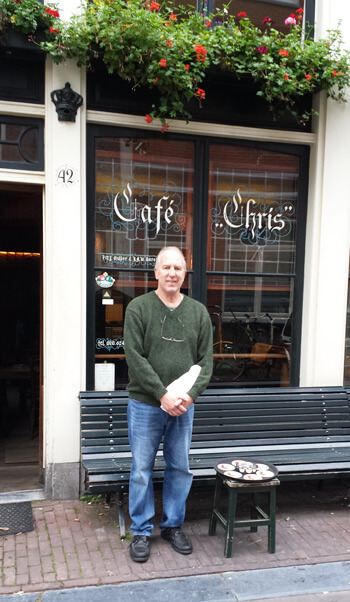 Cafe Chris was established in 1624. I just love how in most bars in Amsterdam, each brand of beer comes in a uniquely shaped logo glass! Aren’t these logo glasses beautiful? 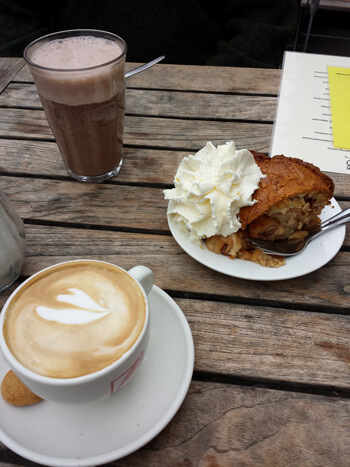 9) Eat an apple tart at Winkel. I think the entire 4 hour transit to and from the airport is worth it if this is ALL you get do to in Amsterdam. 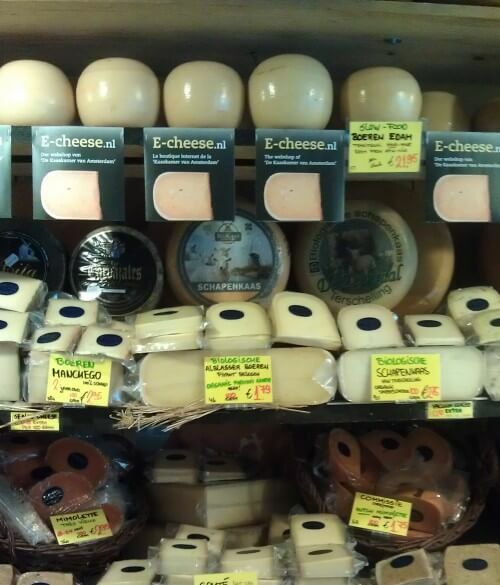 Dutch cheese is famous worldwide. 10) Try some Dutch cheese. Amsterdam is famous for its liberal marijuana laws, so that green leafy smell outside the train station? Yup, it’s marijuana. And those smokey coffee houses? Yup, that’s where it’s sold. Yes, you can get coffee there. But that’s not why most people go. I’m not putting this on my list of recommended activities, just filling you in on the local tourist culture. Besides, you’re on a tight schedule because you have a plane to catch, right? I love Amsterdam. I’ve been there five times, but always look forward to going back. What are your favorite Amsterdam activities? 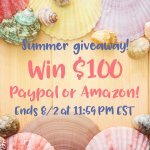 Let me know by leaving a comment below. Chicago but couldn’t leave my baggage, so I had to hang around at ORD all day. Ditto any smaller town or city in Europe when travelling by train. Do check first!! Yes I agree Barbara, Amsterdam is a fascinating place. We did the yellow cycling tour which takes you to all of the sights in and around Amsterdam. Cycling is so easy because it is very flat and traffic-friendly in the city. Also a canal cruise is an enjoyable way to see the sites. 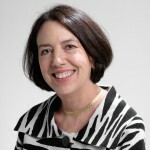 Kathy, I like the cycling idea! I remember doing this during my first trip to Amsterdam in (ummmm) 1977. Now, however, one of my favorite Amsterdam pass times is COMPLAINING about the cyclists! LOL! Seriously, every trip seems to involve saving someone from stepping out in front of a crazy cyclist. SAFETY TIP: the bike lanes are often reddish. Look out for them! I recently learned that the Google Amsterdam office has an indoor cycling track. Which I found hysterical. They don’t get enough cycling outside the office? 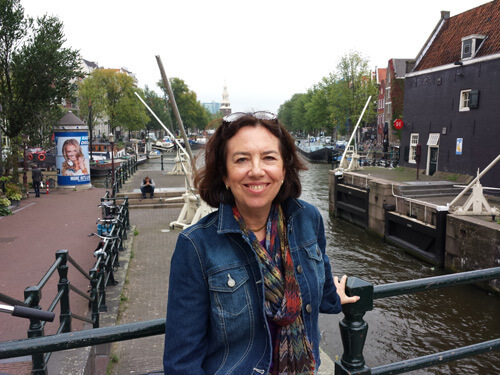 For a funny look at traveling to Amsterdam with kids, please jump over and read my friend Lois Mark’s “Amster-damn” post. Thanks, Barbara! We probably didn’t have the typical experience but it was definitely memorable — and, yes, there are important lessons to take away here!! You’ve certainly captured the essence of this great city by visiting those few sites. We were just their a few months ago and loved it. As a layover stop it really is a managable place to get a feel of in a short time. Great advice! Yes, Leo, they are still doing the canal tours. But I’ve never done one. Something for next time! 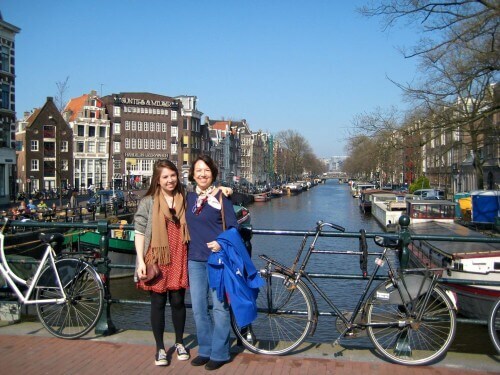 My uncle took me on that red-light district walking tour … when I was 15. Sadly I was too young and naive to know what I was seeing.